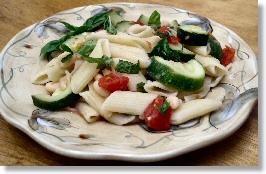 My garden is bursting with zucchini and basil right now, so I thought I’d share a favorite recipe. I’m not sure where it came from, I think a magazine. I jotted it down on a post-it and it became something the whole family loves. Sauté garlic and pepper flakes in a few tablespoons of water or broth, about 1 minute. Add zucchini and sauté about 5 minutes, adding more liquid if needed. Add beans, tomatoes and salt. Simmer 5 minutes. Top with basil and serve on pasta.